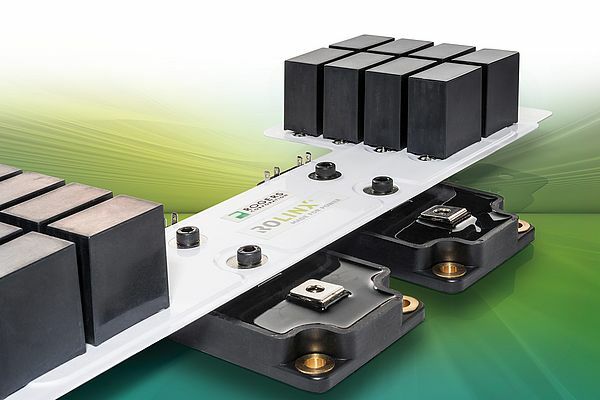 Rolinx CapLink Solutions by Rogers Corporation 's Power Electronicsc Solutions (PES) are the latest additions to the Rolinx busbar family. These new products combine “off the shelf” capacitors integrated with the well-known ROLINX Laminated Busbars. The capacitors are mounted to the busbar with a unique soldering process resulting in the assemblies with extreme low inductance and high power density in a small light weight system, compared to currently available solutions. This unique architecture supports IGBT technology, including Silicon Carbide, and allows them to operate at high switching frequencies, increased voltages and higher temperatures with minimum power losses. These integrated capacitor-busbar assemblies have been developed for critical DC link applications for automotive HEV/EV powertrains and also for solar and wind inverters. ROLINX CapLink Solutions are ideal for any power-management application requiring high-power handling capabilities, low equivalent series inductance (ESL), low equivalent series resistance (ESR) in small, light-weight assemblies such as DC link systems in EV/HEV as well as in industrial systems.